Katrina is a charming 24-year-old with medium-length brown hair and a bright smile. She likes bracelets – especially the ones she makes herself. Katrina lives with her parents and shares a room with her younger sister, Kylie. Kylie is home temporarily until her college program begins and is working at Fleet Farm. Katrina loves her family, but can’t wait to have her own place and her own bedroom! Her immediate goal is to move from home to her own apartment. She has already applied at Iverson Court, but she knows there is a lot to do before she can make the move. She wants to be able to adopt a kitten. She doesn’t have a pet now – not even a fish – and is looking forward to possibly living with a cat. She currently works at Steak Shop Catering, where she fills and covers cups of cut fruit, pudding, and Jell-O for Meals on Wheels. She also cuts bread and sometimes makes cookies, but admits that is NOT her favorite task. She is planning to ask for more hours so she will be able to move into her own place. Katrina has been going camping a few times a year for the past 3 years at Prairie Island Campground. Her only experience with camping prior to this was staying in a pop-up camper owned by some friends of her family. That was like a “real house on wheels,” she says. Prairie Island is a little more rustic, and this past summer Katrina discovered she wasn’t as much of a fan of “roughing it.” There were a lot of spiders that they had to clear out of the camper before they moved in. “There were a lot of mosquitos too,” she says. She did like making pancakes and s’mores and walking along the river, though. 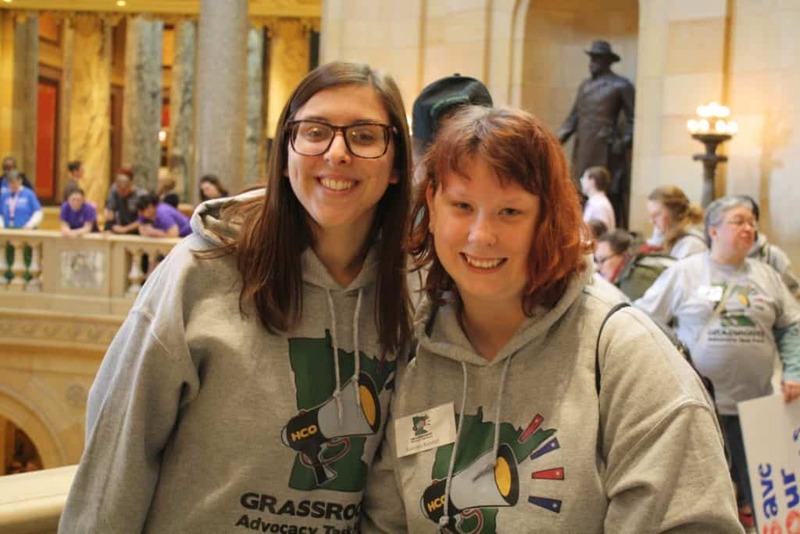 Katrina enjoyed traveling to St. Paul this past year with the HCO Grassroots group to meet with legislators. She took the day off of work and spent her time there carrying a sign encouraging the legislators to support providers like HCO, which need help funding critical services and attracting good staff members. Katrina is a regular at Saehler Drive, which she likes a lot. She loves celebrations and is the party planner at the house. They make food and punch, and they have a great time. She likes the Compass dances, and she was part of a costume contest on Halloween where she took third place. “I got beat out by a monkey and a witch!” she says. She went as a Skeleton Bride. Katrina’s energies continue to be spent on preparing to live independently. She is working on saving more money and needs to try for her driver’s license. She dreams of living on her own, being able to invite friends over, relaxing, and enjoying her kitty.